reintegration and the benefits to society. with our incredible faculty and students. The University of South Florida Sarasota-Manatee is invested in the success of our students with a learning environment that spans far beyond the classroom. When world-class faculty instruction is paired with hands-on experience, student skills develop quickly, and abstract concepts become vivid and tangible. We believe in providing our students with many opportunities to gain hands-on experience, whether through internships, teaching labs or personalized faculty mentorship. Investing in our studentsâ&#x20AC;&#x2122; success is investing in the future leaders and innovators of our community. faculty on a oneon-one level. that reflects our globalized world. what such a life entails. aging is being rewritten before our eyes. 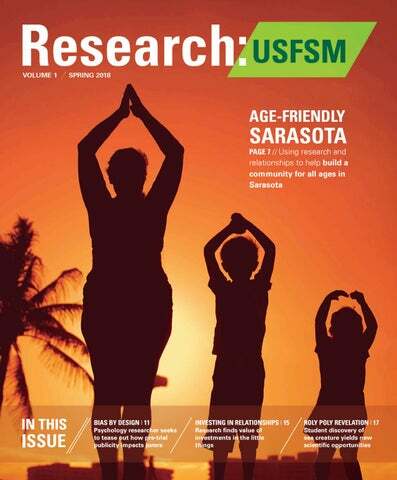 of aging studies at USF Sarasota-Manatee. number is 33 percent, and the median age is 54.
and support from The Patterson Foundation. for older residents from a different angle. being piloted for feasibility as a national model. When you make a community better for people who are older, you are making it better for people of all ages. legion of volunteers – Black said some local organizations have hundreds of volunteers. when it comes to volunteering, there is increasing interest in strengthening the relationships between the generations in Sarasota County, which has a disproportionately lower share of millennialaged adults.” Black said. to discuss what being “age-friendly” really means. In her Physical Changes in Aging class she simulates sensory changes with aging such as vision and hearing loss. She said her students report back about better understanding older customers and clients in their work and with their families. the far-reaching policy implications of the age-friendly work in the region. For example, Sarasota County has adopted a voluntary resolution for builders to design homes with universal features such as wider doorways to accommodate wheelchairs or grab bars in bathrooms. What questions should we ask of an agefriendly community? Outdoor spaces and public buildings: Are parks, parking lots, shopping venues and government centers safe, accessible and barrier-free? Transportation: Do residents have access to reliable, affordable transportation? Is the design of traffic-related infrastructure – signs, traffic lights, sidewalks – helpful to drivers and pedestrians of all ages? Housing: Is housing affordable, well-located and designed in a manner that allows for independent living? Are there options for shared or communal housing? Social participation: Does the community promote a variety of interactions that allow citizens of all abilities and financial means to participate in community activities? Respect and social inclusion: Does the community foster intergenerational understanding and respect for aging persons, as well as positive images of aging? Next Avenue Top 50 National Influencer in Aging, has also partnered with AARP Florida and other age-friendly movements across the state and nation. Recently, she was invited to help draft policy about creating an age-friendly public health system for the American Public Health Association. those cases had on juries’ decisions. at trial versus that which came prior to trial. then it’s too late. They’ve already been tainted. jury deliberations in the original study. news, they’re actually producing the news. First Amendment rights to free speech and the press often conflict with a defendant’s right to a fair trial as guaranteed under the Fifth and Sixth Amendments, Ruva said. something she said always surprises her colleagues. in the legal psychology community, appearing in leading journals like Law and Human Behavior and garnering the attention of faculty at leading institutions in the field. Jay College of Criminal Justice in New York. individuals to improve their own relationships. partners. Coy explains, “Partners matter. other’s commitment, above and beyond our own level of satisfaction. That theoretically, the partner’s actions matter to a greater extent than just making the partner happy.” Coy’s discoveries about relationships unearth more questions about the hows and whys of commitment and the implications moving forward. is being tested within psychology. had never been found so far north. of Sarasota and Manatee counties. students Edgar T. Bischoff, Moe Aye, Keith W.
venture far from their rocky intertidal habitats. also dry out quickly, and they can’t swim far. and results in subtle evolutionary changes. characteristics, but unique genetic signatures. area in which Santamaria has deep expertise. South Africa and the Pacific Ocean. [Ligia isopods] are a perfect living laboratory and a wonderful teaching tool. reveal fundamental insights into their evolution and behavior. Santamaria said the students’ discovery “opened up whole new avenues of research. preliminary research findings with his own experiences as a Marine, he’s proposing that civic engagement — everything from mentoring at-risk youth to volunteering at disaster sites — could benefit returning vets and American society at large. returning from Iraq and Afghanistan were volunteering for community service in record numbers. the local, state or federal level,” he explained. If my research finds that community engagement helps veterans reintegrate, then maybe there are changes that can be made. the creation of public-private partnerships to further invigorate community engagement among vets to the benefit of service people, civilians and American democracy. literature, a person needs three things to become civically engaged: skills, desire and opportunity. Hodges’ research indicates that Marine Corps training provides the skills and desire. He’s hoping that his research can provide the opportunity. and strategy of the movement,” he said. Ministry of Defence, as well as the U.S. These movements actually are very conscious, able to root themselves within the context in which they operate. to develop counternarratives,” Pieri said. Applied Economics earlier this year. to be published this year. wind speed and barometric pressure. closer to home – hurricanes. STUDENT SUCCESS IS COMMUNITY SUCCESS An important role of public higher education is to train critical thinkers. Those who become knowledgeable, involved citizens contribute meaningfully to the region’s economic and social success. of cost, to further present their work. advisors and Wall Street traders. a brother to veteran suicide. into the Culinary Innovation Lab. conference last fall in Philadelphia. academics to help public school students. funds for the remaining stations. hotel software into the hospitality curriculum. average pre-test result of only 64 percent. student learning in their K-5 classrooms. average on the post-test soared to 84 percent. growth from pre-test to post-test. she said. “I also want more people involved. 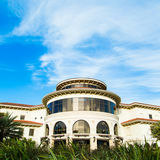 USFSM benefited you in graduate school? Columbia University than my peers. in research as an undergraduate student? Take advantage of every opportunity you can. You don’t have to know exactly what your main interest is-jump into something that you think you may have an interest in. Even if it ends up being something you won’t continue to do, you’ll definitely learn something; it will lead you on a path and narrow your direction of focus. Also, have fun! on the association between youth adult relationships and youths’ future aspirations. Do you feel that the skills you gained at USFSM benefited you in graduate school? Currently, I am a graduate student at Boston College obtaining a master’s in Educational Research Methodology. I felt that I was ahead of my classmates because of the prior research skills and experiences from my undergraduate degree at USFSM. When beginning graduate school, I had prior knowledge of the content that was being taught in my courses. violin, viola, cello and bass players. work directly with the PMP String Orchestra. Plan to attend our 25th Annual Brunch on the Bay. Sunday, November 4, 2018 // 11:30 a.m. Enjoy delicious dishes from our areaâ&#x20AC;&#x2122;s best restaurants and help raise scholarship funds for USF Sarasota-Manatee students. For more information, contact Pam Gleason at pjg@sar.usf.edu or 941-359-4603.